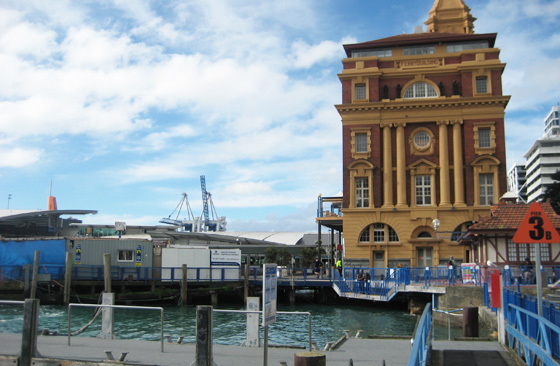 Auckland’s Downtown Ferry Terminal is the hub of the city’s ferry network, connecting the central business district with a wide range of mainland and island locations. After 100 years of service, the Terminal’s historic piers are in urgent need of repair. BBR Contech is helping to undertake this work – restoring the deteriorated concrete piles, deck beams, cross-bracing and deck soffits to their original service capacity. The work involves temporarily supporting much of the substructure owing to the degree of deterioration. The defective concrete is being removed using ‘hydro-demolition’, a process that uses high-pressure water and results in an excellent bonding surface for repairs, while minimising noise in this busy commuter environment. Repair techniques include spraying, forming and pouring high-performance micro-concretes. The Auckland Regional Transport Authority chose Contech through a competitive tender based on price, quality, methodology, experience and resources.. Contech has delivered on all counts, coping with a very challenging environment, a lot of unknowns and a significant increase in project scope – all with minimal impacts on the thousands of people who work at and use the Terminal every day. Completed in mid-2010, the project will extend the Terminal’s life by 15 to 20 years – enabling it to continue providing a safe entry and departure point for the ferry users.